Slam reinvigorated public poetry; could the microphone reinvigorate memoir? I’ve never been good at acting. Every time I tried, I could always tell I was pretending. On the other hand, I’m great at reading prose—Old Testament readings on Sunday, excerpts from essays in the classroom. Watching these five readers perform today, I feel like I might have finally found my theater, much the same way I found my genre when I stumbled onto the personal essay. So if you think memoir has trended, get ready. The folk on this panel might just have the hashtag to turn it all around. They inject attitude into their nostalgia, take you to the ledge with their humor, then let you hang in the midst of their vulnerability. It’s like This American Life without Ira Glass, without music swelling in between, storytelling on the stage. I’m ready to give it a try. If you are, too, and you’re in Chicago, check these venues out: www.storyclubchicago.com, www.thekates.org,www.thismuchistrue.com, www.heresthestory.org, www.essayfiesta.com. This sounds wonderful. Yet another reason to wish I’d made it to AWP! Thanks for sharing. I’ve been a part of a lot of the memoir/storytelling events in Chicago for over a year now, and it has been a wonderful experience. I’m a published author – including a memoir – ACCIDENTAL LESSONS – and a Kindle book (soon to be a paperback) of short-short stories – AFTER OPIUM. I’ve used forms of the stories from these books and pieces that I’ve published or wish to publish elsewhere in front of a microphone. I do have some broadcast background, and it does help. But there are plenty of people who have jumped in front of that mic, with very little experience, but with wonderful stories to tell. I will keep doing it…and in fact will be part of “Here’s the Story” at Stage 773 in Chicago this Sunday night (3/4) at 8pm. Great place to come see it all unfold! And – to take part! I’m the producer of Essay Fiesta and friends of those who performed during Memoir Without a Net. Let me just say that the movement of the live lit scene (as we call it) is huge here in Chicago and incorporates a cross-genre of artists from comedy to theater to literature. It’s an exciting form, one that has grown out of the tradition of other Chicagoans such as Studs Terkel and Ira Glass. I hope with the encouragement and support of people like you we can further legitimize this captivating genre of literary theatre…or is it theatrical lit? 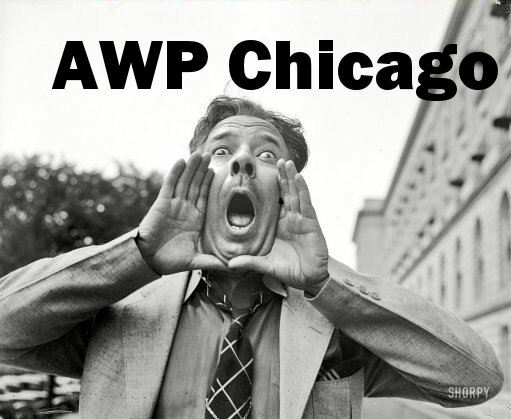 I went to AWP this year. It was an awesome experience. Thank you for sharing. I cannot wait to go back next year! You are currently reading AWP 2012 – Memoir and the Microphone at BREVITY's Nonfiction Blog.